Happy Chinese New Year! According to Chinese astrology, 2019 is the Year of the Earth Pig, which brings money luck in investing, joy, love, and friendship to all, as the Pig is a magnet for success in all areas of life. In true Pig year fashion, this February will be a month full of amazing goodies and things to come that I cannot wait to share with you! Keep close and stay tuned. 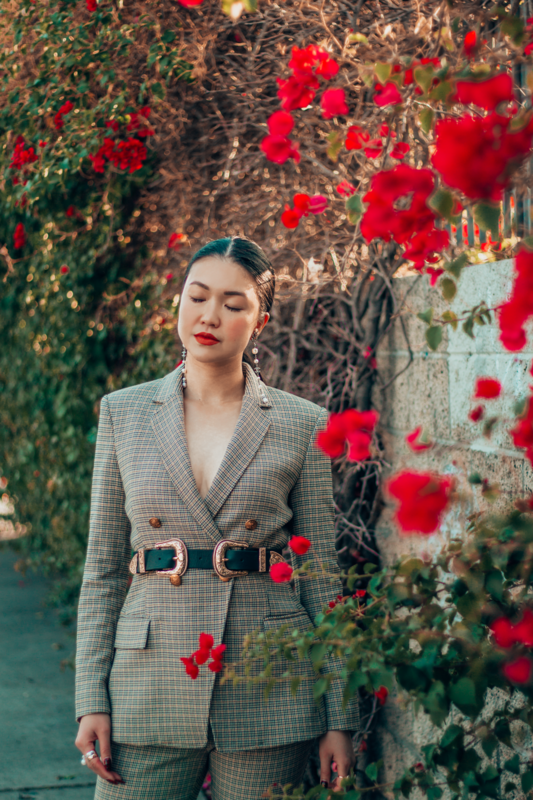 And first, this article: Being a big fan of plaid and all things windowpane for a long time, I’ve been meaning to share what I think are the top 3 checked clothing items to have in your closet. These items are standout pieces, and yet, highly wearable. I absolutely love this checked coat from Zimmermann — it’s oversized, bright and brilliant, and just screams chic when you wear it. (Come to think of it, perfect for Chinese New Year too, what with red being an auspicious color.) Not your average checked jacket, this piece of outerwear takes centerpiece when you put it on; you don’t really have to worry about what you’re wearing underneath this boldly-hued behemoth of a coat. I paired it with rich burgundy and brown shades to provide more depth to this monochromatic look. We all have the usual plaid shirt or sweater, but not all of us will consider buying anything else checked in this clothing category. This Self-Portrait top, with its uneven hem and frills that drape your body’s every curve, is a case in point why you should. Not only is it incredibly flattering, with a fit-and-flare cut that accentuates the waist, it immediately draws attention to the eye. That mix of mesh and fabric forming a sweetheart/high neckline combo looks great on most, and is so easy to dress up or down. I dressed it down with hiking boots and braids, and added a touch of wintry luxe with some velvet leggings. When I saw this A.L.C. suit with its subtle yellow and blue lines, I knew it was meant for me. It already fit really well without much tailoring — a sign that A.L.C. is one of the brands for me — and I like how it’s not a boxy, oversized suit, but a true power suit. I would suggest sizing up if you’re in-between sizes so a tailor could take some parts in and make it an absolute perfect fit for you. Spiced things up here with a cowboy belt and some gorgeous Chanel earrings.